I’ve written enthusiastically on this web-blog before about Amtrak and the need in this country for rail technology that truly brings us into the 21st century. Today, I boned up on it a bit and here’s where we actually stand right now in regard to high-speed rail in the United States. But first…is that not an absolutely amazing sight pictured above? 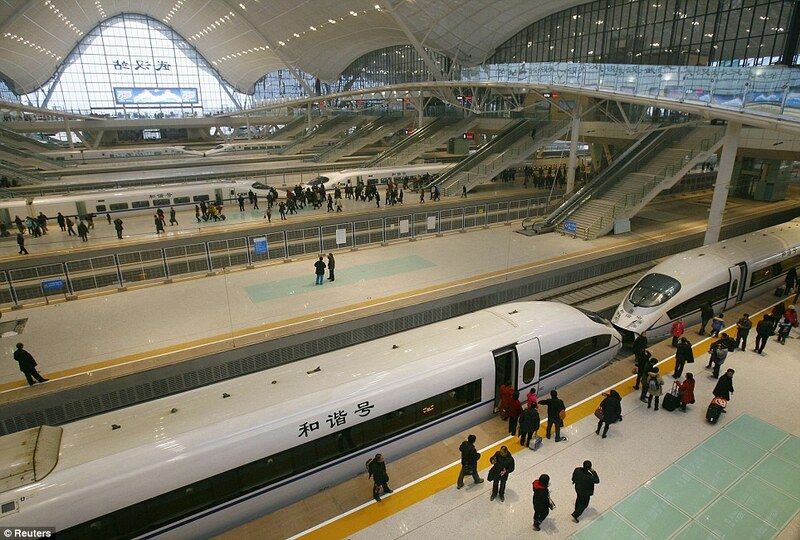 That’s the new generation of Chinese high-speed trains. These things can go 245 mph and actually average 217 mph between the modern Chinese cities of Guangzhou and Wuhan. Took only four years to build. Granted this is China and the government controls everything so there weren’t exactly any controversies over land rights and labor union contracts. They have a lot of cheap labor and supposedly the engineers on this project worked 14 hours a day with no weekends and no holidays with three sets of construction workers each laboring on 8-hour shifts, 24 hours a day to the get this done. The democratic process and little things like labor laws and debates over congressional funding would never allow us to accomplish anything like this anytime soon. But it is obviously in the realm of possibility, because, as you can see…it’s been done. As for us, we plod along a little more slowly but there has been progress. Back in April, President Obama announced a high speed rail strategy plan. My new favorite web site, infrastructurist.com, has all the details. In a nutshell, this is the first-ever White House endorsed national rail plan in American history. It calls for an initial $8 billion in funding. Turns out Congress is only going to spend $2 billion in 2010, but that’s ok. It’s the first time this much money has been allocated to improving America’s rail systems and it appears these will be annual investments so more funds will be on the way. ….the administration will be spending its funds on the existing Congressionally-designated corridors, which include lines in the Pacific Northwest, California, Texas, the Gulf Coast, Florida, the Southeast, the Midwest, Pennsylvania, New York, and Northern New England. The report, unlike previous federal descriptions of high-speed rail lines, actually endorses connecting these corridors with one another, something that had been left out of previous DOT [Department of Transportation] reports. There are critics, of course. Here’s an articulate argument against spending this kind of money on trains from the Heritage Foundation’s Ronald D. Utt. He argues there’s actually much less here than meets the eye. First, this could be a windfall for the nation’s freight railroads because a lot of the track needed to run these trains is already owned by them and they’d be in for a ton of federal subsidies to allow passenger trains on their territory. Plus, he maintains, “high speed” is a misnomer. To build a truly high-speed rail system you’d have to start from scratch and build completely new tracks. He notes, for example, that the Acela goes 150 mph for only a 35- mile stretch between New York and Washington and that it actually averages 80 mph because of roadbed deficiencies and existing rail congestion on the Northeast Corridor. Since a lot of track around the country is in similar condition, high-speed rail in the U.S. will never truly be that high-speed unless a truly astronomical sum of cash is put out to build an entirely new rail infrastructure. Even if the tracks were in great shape, our friends at the Heritage Foundation and the Cato Institute would never endorse such a thing anyway because they’re not that hot on government spending on much of anything. But, hey, as long as we’re going to be throwing cash around like drunken sailors for everything under the sun anyway- why not an investment in rail systems? It creates jobs. It builds new modes of transportation that can help wean us off fuel-guzzling cars and airplanes. Honestly, do you really want to fly that much anyway, these days? Anxious to sit next to a guy with a bomb in his underpants? Can’t wait to put on a strip show for TSA workers when you walk through the new explosives detectors they’re going to be putting up? Seriously, the future of transportation is not the automobile, the airplane or those flying scooters we used to see on the Jetsons. Look at China, Japan, Germany, France and England. The future there, is now. And it’s riding on high-speed rail.